As we discussed before – WordPress is completely amazing. With lots of hooks and functions you could achieve literally anything. You could modify WordPress Admin are the way you want, like, modifying list of columns, changing order, removing admin options, hiding Help link, etc. In this tutorial we will go over simple but for someone very effective way to show thumbnails into WordPress Admin area. 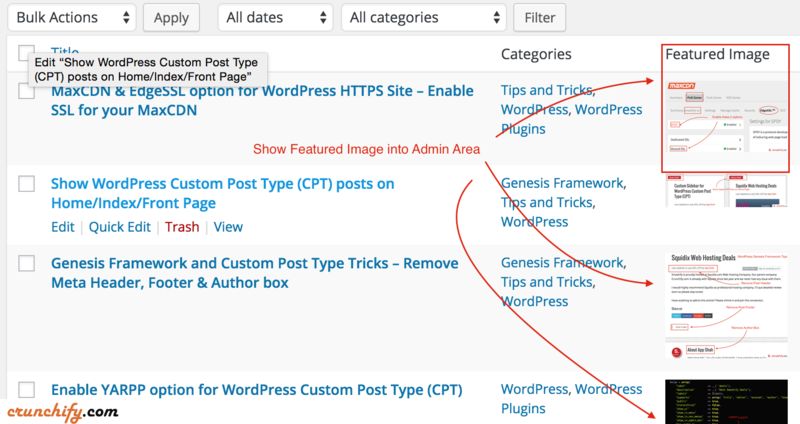 Why do we need Featured Image in WordPress admin panel? Last week I moved my site from one domain to another domain. Because of some complexity I lost Featured image for quite a few posts. Now I wanted to have featured image for only those posts. There are few WordPress plugins also available which fills the featured image with 1st image from post but I didn’t want that. So decided to create script which shows featured image in admin panel if that exist OR just show nothing. So I could manually go to that page/post and add featured image. You should see featured image in Admin Panel. We are using manage_posts_columns and manage_pages_columns WordPress filters and manage_posts_custom_column and manage_pages_custom_column WordPress Actions. I’ve just doubled check and you are right. As it’s ok to use echo with the_post_thumbnail(). Happy blogging and keep visiting. This works beautifully. I’m just wondering if there is a way to put the Feature Image column as the first column? Hi Paul. I’ll check this out and update. Excellent tutorial! Really your tutorial is fully informative. This codes very simple and easy to used. how to show thumb at first? you mean as first column? Excellent – thanks. Just needed to add a backslash to escape the apostrophe – should be doesn’t. Posting this with a credit and link on my site. That’s right. Thanks for pointing it out. I’ve just added backslash and updated tutorial code. I had another developer point out some missing brackets on the ‘if’ statement. Hi Haiz – just checked and above code is working very well. Are you facing any issue? Try to get some more information from developer you referred so if anything I could changed, eventually will help others.